November 15, 2018 – “A passion for history, a taste for aesthetics and ethical respect,” this is how Dr. Jonas Emmanuel Flueck describes his work in the coin business. As executive director of the auction house “Lugdunum GmbH”, based in Solothurn (Switzerland), his consignors’ satisfaction is his top priority. The catalogs of both his public auctions as well as his e-auctions demonstrate his strong commitment to the highest scientific standards. He organizes online auctions several times a year. Once or twice a year, public auctions are planned in Zurich. The first appraisal of any possible consignment is free of charge. In addition, Lugdunum GmbH specializes in consulting and supporting collectors, particularly regarding auction representations. However, you can certainly also expect all of the services good coin dealerships are known for, including the acquisition of coins and medals. Dr. Jonas Emmanuel Flueck, executive director of Lugdunum GmbH, looks forward to meeting his customers. You can find him either at the company headquarters in Solothurn or at every important coin convention. Dedicated coin collectors certainly already know Dr. Jonas Emmanuel Flueck, who speaks several languages fluently. The historian has been working in the coin business for more than a decade. As a numismatist working at Spink in London and later at Hess Divo – where he advanced to the position of managing director – he was in charge of numerous catalogs and auctions. 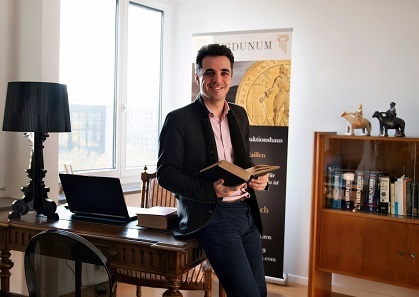 Dr. Emmanuel Flueck is part of the young generation of coin dealers who are generally referred to as “digital natives”. He considers new technologies both a chance and a challenge. As a trained archeologist, he is aware of the problems that can arise in the context of cultural property laws. Which is why he established the Ex-Numis project in 2016. The latest image detection software and an archive of hundreds of thousands of auction catalog images allow him to quickly find out whether or not a coin has already been shown in an auction catalog. Needless to say, the research of provenance of ancient coins is part of his own auction catalogs as well. Dr. Flueck is also an active member of numerous international associations. In 2017, he held the office of treasurer at the IAPN (International Association of Professional Numismatists). In 2018, he took over the position of general secretary at the Verband Schweizerischer Berufsnumismatiker. E-Auctions are held regularly, the most recent one on November 15, 2018 starting 6 pm. The first public auction is scheduled to take place in 2019. Please don’t hesitate to get in touch should you be interested in a consignment. Enquiries can either be discussed personally in Solothurn on appointment only: Lugdunum GmbH, Bielstrasse 3, 4500 Solothurn, on the phone: +41 (0)76 706 18 19 or via email. Jonas Flueck also attends the most important coin conventions at home and abroad. You will find the respective dates on the Lugdunum website. Learn more about Jonas Flueck in our numismatic Who’s who.